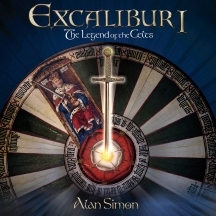 EXCALIBUR I is the GOLD CERTIFIED first album of the quadrilogy based on the legendary Arthurian saga. This definitive album release, with new artwork, is based on the legendary story the CELTS and features guest appearances from Roger Hodgson (Supertramp), Fairport Convention, Dan Ar Braz, Tri Yann, Angelo Branduardi, Didier Lockwood and Gabriel Yacoub. This album re-release will be supported by a worldwide marketing campaign and extensive promotion.